I've just finished translating the little pamphlet that comes with the Etegami starter kit, and though it doesn't say anything that I haven't said a million times on this blog, I thought it would be good to post it anyway. I have chosen to depart from traditional methods in some of my recent etegami, but that is only after being steeped in the traditional methods for so long it has become a natural part of me. From those roots I occasionally venture into new territory. For the beginner etegami artist, I recommend digesting the concepts in this pamphlet to get started on a solid foundation. (1) The motto of Etegami is “It’s fine to be clumsy. It’s good to be clumsy.” What matters is whether or not you have put your heart into your painting, not whether the painting is a fine work of art. Your earnestness communicates to the person who receives the card, and touches his heart. 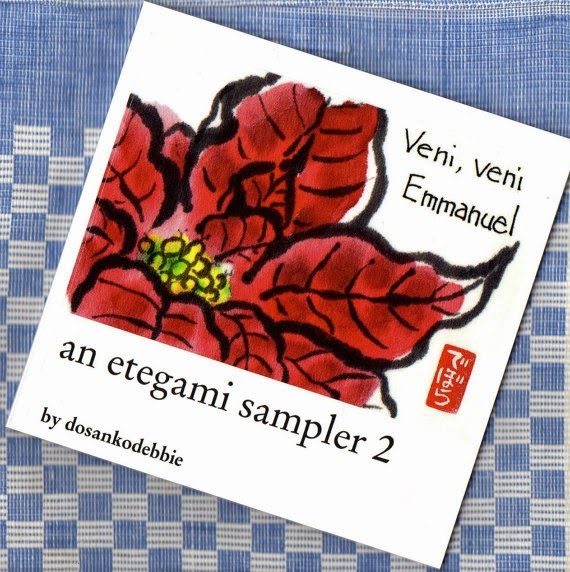 Each etegami should express something of the character of the person who painted it. (2) Etegami is a one-shot deal; there is no underdrawing or practicing on another piece of paper before doing the actual painting. Every time you paint an etegami, you are, so to speak, “broadcasting live.” There is no concept of a “failed” or “ruined” etegami. Every etegami you paint should be placed in the mail box and sent on its way to someone else. 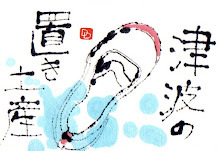 (3) Unlike many other forms of traditional Japanese art, there is no “model” etegami painted by a master for you to imitate. The flowers and vegetables created by the hand of God are your best “models.” Observe these models closely before you begin to paint them. (1) The blank washi cards used in Etegami are called Gasenshi. They have various qualities like “bleed” that help produce much more interesting paintings than the ordinary blank postcards sold at the post office. (1) Hold your ink brush lightly at the very top of the shaft. (2) Raise your elbow, relax your fingers, arm, and shoulders. In Etegami, anything that is part of your daily life can be your subject. If this is your first attempt at making etegami, choose something with an easy shape to draw, Vegetables and fruits are a good choice. (2) Use sumi ink and a line-drawing brush to make the outline of the subject. • Closely observe one subject. •Start with some aspect of the subject that catches your eyes. Draw as slowly as you can, with as thin a line as you can make. Place your color with your coloring brush quickly and rhythmically inside the border of your image. Tap the colors softly against the card as though you were tapping a drum. If you try to mix and overlap many colors, the colors will appear muddy. Your purpose is not to make a photographically accurate image of your subject. Using bright-ish colors will result in an attractive etegami. Chose words that you would normally use. Think of the person you plan to send the card to, and write as though you were having a conversation with him/her. This should make it easier to find the words to write. If you have a name chop and the traditional vermillion-colored paste or stamp pad to use it with, press your chop in an open space that feels balanced to you. This will pull the whole etegami together and make it feel complete. Name chops are easy to carve with a craft knife from rubber erasers. Otherwise, draw your initials or a symbol of your name with red ink. (6) When your etegami is finished, address the front (non-image) side of the card, put a postage stamp on it, and stick it in the mail box! [Although you are free to use tools that are most convenient for you,] nothing beats the warmth of an image drawn with sumi ink applied by an ink brush. Lines drawn with an ink brush will bleed and wobble, getting thicker and thinner in places, as though your very thoughts and feelings communicated to the paper through the ink brush. Don’t be afraid of using sumi and ink brushes. [Gasenshi are washi postcards for Etegami use] They have many properties-- such as “bleed” and “scrape” and a particular responsiveness to gansai paints-- that make Etegami so interesting. Unexpected and unplanned “imperfections” are what make Etegami appear so alive and warm. ◆Keep your etegami equipment close at hand (preferably all together in a box or bag) so that you can draw whenever you get in the mood. ◆Get into the habit of drawing one a day, for a little as 30 minutes each time, the same way you might keep a diary. 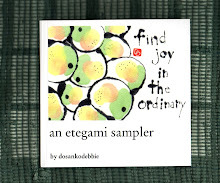 ◆Find people who look forward to receiving your etegami. In the beginning this may be your parents, children, or close neighbors. Having someone who looks forward to your etegami will encourage you to keep painting them. ◆Find things you like to paint. If you chose a theme, something that interests you, you will be motivated and it will be easier to maintain the pleasure of painting. Age has nothing to do with etegami. Etegami is a great way for children to stay in touch with grandparents who live far away, or who have fathers living away from home for some reason. Sending and receiving etegami between family members is a lot of fun. Why not give it a try? This is lovely and encouraging and accepting of the beginner like me. I have a better understanding of how etegami functions now. Thank you for this. It seems like such a deeply personal and freely creative art form. Full of delight and wonder and oneself. This is what I was waiting for. I'm teaching watercolour for kids. 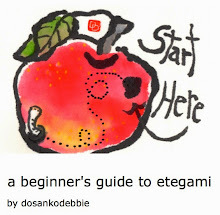 Sometimes we do, Etegami, but I couldn't explain about Etegami very well in English.So this is really useful. Thank you. Fascinating-- I never knew all the rules & techniques although I certainly appreciate the results! I'm going to have to try playing with holding a brush like that, although I don't have all the proper gear... I still think it will be a valuable exercise, so very different from my usual miniature-influenced approach. I can't wait to get my kit and try one! Great instructions my friend! This sounds like something I need - both ways. Thanks for posting it.